If you've read my review of Stephen Baxter's first anthropomorphic mammoth novel, Silverhair, you'll know that this is a series well worth following. Volume two, Longtusk, opens with Silverhair, principle character of the first volume, recounting to her daughter one of the stories from the Cycle, the mammoths' great oral history. The story she tells is that of Longtusk, the greatest hero in the Cycle, and the only bull hero in their long history. And there, a wise old mammoth rather neatly sums up what Baxter achieves with this novel: exploring the truth behind the legend, the many ways in which history is glossed over and polished in the re-telling. History, not necessarily written by the victors, but by the survivors; history recounted for its value as survival lesson, and not necessarily for its relationship to the truth. Longtusk is a hero, of course, but not in such a simple black and white manner as legend eventually tells. He helps his clan survive by a combination of good luck, bloodymindedness, and a series of logical, observation-based deductions common to many of Baxter's protagonists. And also, at the end, by one almighty piece of good luck in timing as geological and climatic circumstance combine with the peak of the action to provide Longtusk with a solution to his clan's problems. It is hard, however, to begrudge the author's use of this device as it is a striking piece of imagery and imagination, tying the mammoths' fate to major geographical change. 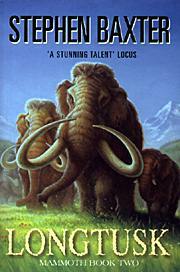 Where Silverhair was a superb piece of ecological fiction, Longtusk's encounters with early humans, with whom his fate is inextricably bound, sets the scene for Baxter to move on to a fine piece of paleoanthropological fiction, combining science-fictional speculation of the highest order with his customary meticulous research. His depiction of early human life is so painstaking that even when some of the details seem far-fetched -- a mother wiping her child's bottom with her hair, for example -- the reader has every confidence that the detail has some basis in research. Silverhair told the story of the last mammoths, surviving in remotest Siberia to the present day; Longtusk, the second volume in the series, steps back into the species' history, to a time when they began their decline. The epilogue to Longtusk, and a number of scene-setting hints in Silverhair, make it clear that volume three will take us into the species' future -- a trip that I, for one, look forward to eagerly. features - Stephen Baxter interviewed by Nick Gevers; find out more about Stephen Baxter; read reviews of Stephen Baxter's novels and collections.